From Spaetzle to Samosas: Holding on to Summer Salad. Holding on to Summer Salad. 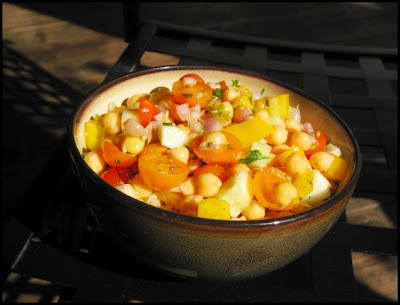 I just posted this salad to my facebook and judging by the number of 'Like' clicks the colors must appeal to everyone. I created this salad a few months ago and it has become a huge hit among family and friends alike. The simplicity of this salad is the key. It comes together in mere minutes but I do recommend letting it sit for an hour to allow the flavors to come together. The other appeal of this wonderful salad is that the options for change are limited only to your imagination. A doctor's appointment a few days ago was a wake-up call. I was placed on cholesterol lowering medication. Frankly, I have no intention of taking them. I will work at changing my dietary habits even more and eating a healthy, colorful, balanced diet without sacrificing flavor. This salad is a good step in that direction. One can chickpeas, drained and rinsed. And now that you have the basic ingredients it's time to have fun. Toss, it all together and get creative. Alter the flavor by changing the dressing. For acids you can add balsamic vinegar, lemon juice or red wine vinegar. For the seasoning add pepper, mint, basil, parsley or whatever else you feel like. Added toppings that are wonderful are feta or any tangy goat cheese. If you like up the spice factor by adding diced jalapeno. Skip the olive oil and make a dressing by mixing yogurt, the seasonings, and onion (plus garlic if using) together. A Yogurt based dressing will work extremely well with some extra chopped onion and plenty of mint. The chickpeas make this salad is quite substantial. Along with some crackers or toasted pita bread it would make a great light lunch.